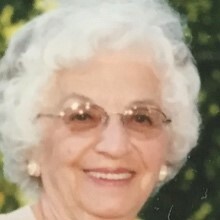 Stasia Krantz Meschisen, 100, formerly of Wyndemere Woods, Woonsocket, RI and Barstow Rd., Warwick, RI, reposed in the Lord on Sunday, March 18, 2018 at Milford Regional Medical Center, Milford, MA. She was the daughter of the late Stanley and Paranka Krantz. She is predesceased by her husband, John, son, John S. Meschisen, and three sisters, Anna DeCosta, Mary Correia, and Olga Enright. Born in Woonsocket, RI, she lived most of her early years there and worked as a spinner at Falls Yarn Mills. In 1954 she married John Meschisen and moved to Providence and then Warwick, RI where they raised their two sons. She worked at Federal Products as an Assembler until her retirement in 1982. Having reached the age of one hundred last June, she was invited to a special brunch in honor of Rhode Island Centenarians where she met the Governor, Gina Raimondo and other state officials. Stasia is survived by her son, Donald, and his wife Kathleen R. Meschisen, and daughter-in-law, Janice Meschisen. She delighted in her six grandchildren, Melissa Baker and her husband, Troy, Karen Skocypec and her husband, David, John D. Meschisen, and his wife, Anu, Michael Meschisen, Mark Meschisen, and David Meschisen. Her memory will continue to live on in her six great grandchildren, Tyler Baker, Abigail Baker, Colin Baker, Emaline Skocypec, Evelyn Skocypec, Sitara Meschisen and with several nieces and nephews. Relatives and friends are invited to attend calling hours on Monday, March26, 2018 at 9:30a.m.-10:15 a.m. at the Kubaska Funeral Home, 33 Harris Ave. Woonsocket, RI 02895. The funeral service will be held at 10:30 a.m. in St. Michael Ukrainian Orthodox Church, Woonsocket, RI 02895. Burial will follow at St. Michael Ukrainian Orthodox Church Cemetery on Farm Road in Blackstone, MA. In lieu of flowers, charitable donations in Stasia’s memory may be sent to the Leukemia & Lymphoma Society or St. Michael’s Ukrainian Orthodox Church. Kubaskafuneralhome.com.